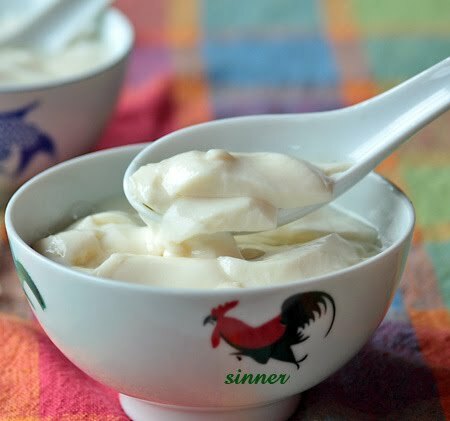 Tau Fu Fa is a very popular chinese dessert eaten hot or cold. It is made from coagulated soya bean milk, served with a sugar syrup. And of course being soy, it has tons of nutritional value. After many attempts at trying to reduce the gypsum content, I believe I have perfected the texture. The tau fu fa was so silky smooth that it just slides down the throat. So soft, it felt like almost like swallowing air. I had to try and reduce the amount of gypsum to a bare minimum as I get the dreaded backache the following day. This is my favourite dessert so can't help but devour the lot in one day. Happy to report that the following recipe does not give me a backache and hence can eat as much as I like. 2. In a small cup, mix together the setting solution. 3. Pour the soy milk and setting solution simultaneously into another clean pot. 4. Give the mixture a quick stir and cover with a cloth before putting the pot lid on. Leave for 30 minutes. Be patient....no peeking ! 5. If there is a thin skin on top of the tau fu fa, lift it off. To serve, scoop out in thin layers to a bowl. Add sugar syrup according to taste. Microwave until sugar is dissolved. This is a very short fast moving 1:51 minute video of the step by step process of making Tau Fu Fah. You can boil your sugar syrup with some pandan or ginger to give it a different flavour. 1. Try not to move or shake the pot during the resting period. 2. The more gypsum you use the harder the texture of the tau fu fah. 3. A lot of people don't like the idea of using gypsum but this is the only option available in NZ. 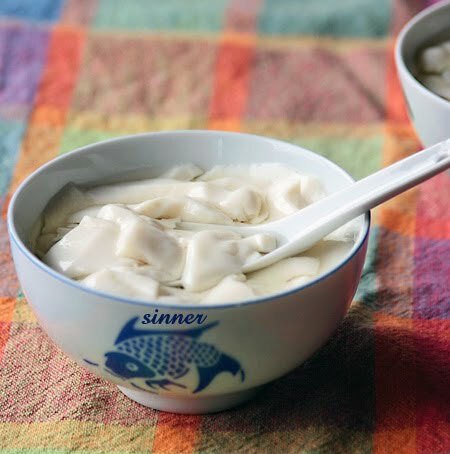 Wow, you made soy milk and tau fu fa! Not too keen on the soy milk but soy bean custard (or pudding, as they call it here sometimes) I love. It's satisfying yet light at the same time. Or do u maybe know where you could get that? Me too, give me a bowl of tff anytime. Gypsum is more common. I bought mine at the chinese grocery shop. I pestered them for months to stock it. Or you could try asking your pharmacy whether they sell food grade gypsum. Cuz we live in same country I think you can easily get gypsum powder in Taiping Asian grocery shop.I went shopping that day and I saw they stock alot of gypsum powder. 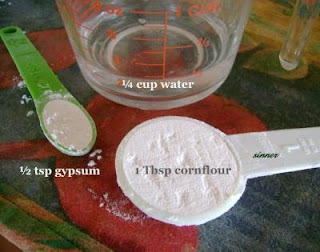 But u r right 1/2 teaspoon of gypsum is the perfect amount used.Cuz my mum friend from HK taught us same method only she didnt use cornflour. Thanks for the Tau Fu Fah Recipe!!! Can't wait to make it ... just have to pick up some Gypsum 1st! Appreciate your step by step video!!! s puppy - I got mine at Lim Chour. tricia - would love to know how yours turns out. You are most welcome. I can't find gympsum here. Instead I managed to get hold of Nigari. Would appreciate if you could explain how I use Nigari in place of gypsum. Quantity as well as method of combining it with the soy milk. I am sorry I can't help you with the nigari as I have never used it before. But I must say I truly enjoyed ur quick video. You make it look so easy! Today while reading some receipe. I saw the use of Nigari on making tofu. And I saw the usage of Nigari compared to gypsum powder? They said if you use 1 teaspoon gypsum powder then you only need to use 1/2 teaspoon of nigari. So I think in this case if 1/2teaspoon of gypsum is used. Then 1/4 teaspoon of nigari should be equivalent to 1/2teaspoon of gypsum powder. Just reduce half the amount of nigari compared to gypsum powder. Made Tau Fu Far using your recipe today and it turned out beautifully. The amount is just right for a family. The recipes that I get from books are usually for such a big quantity that it's too difficult to make and too much to eat. Your recipe is just right for my family and I even have some left over to make taufu for steaming, served with oyster sauce and spring onions the next day! Glad you like the tff. Did you press the tff to make a firmer tofu or left it soft like Ipoh tofu ? I lined my small plastic vege strainer with cloth and left the taufu in it ...left it in the fridge to strain the water out and got a soft taufu for steaming. This took out the water without making the taufu too hard. Will be attempting to make your springy beef ball soon... Thanks again for sharing your recipes. Thats a good easy way of turning this tff into soft tofu. Thks for sharing this delicious recipe. The tofufah is indeed very smooth n silky. I made some last evening n my family loved it!! I use GDL(glucona delta lactone) available in baking stores instead of gypsm.I believe that is a better and healthier. I tried ur recipe but the tau fufa was flakes rather than actual tau fu fa and there was loads of clear liquid on top. I made the soy milk with a soymilk maker... How do I figure out where I went wrong? If you have followed the recipe deligently and still get flaky and watery tau fu fa, you might want to have a look at my homemade soy milk and compare the ratio of beans to water content with yours. I have never used a soy milk maker before so have no idea of the milk concentration. If you continue getting flaky tau fu fah you might have to increase your gypsum. i finally succeeded in making the tau fu fa! It's still not as smooth as yours but will try to double strain it next time. LL, Thanks for coming back and letting me know the outcome. But I am very curious...did you have to reduce the water in your soy maker or add more gypsum ? I find muslin is the best but if you don't have that even a pair of new stocking is good for sieving. I gave up on the soymilk maker-it just was not getting enough concentration on the milk-there is a minimum amount of water you need to put and if you put too much beans it didn't work as well. So I did it with the exact quantities with a blender. I followed ur instructions to the letter. It set but not as smooth as yours. Wonder whether you could throw some light to any further tips I can improve on? LL, getting it to set in my opinion is the hardest part. Now that you have got that sorted , you can work on the smoothness. I do everything as per the video so have no other tips to offer. Maybe like you said, sieve it a few more times through the muslin. If you want firmer tofu, press the curd with heavier weights and leave it on longer until the desired firmness. If it is still not firm enough to your liking, you can increase the gypsum as well on your next trial. Hi, I am staying in moscow, and I don't know where can I get gypsum powder. I would like to try your recipe too, any other way out? I saw a comment stating using GDL (glucano delta lactone). What is that? and what should be the portion? I really hope to make one cause we can't get any tofu fa here in moscow. And I really miss having it. I have heard that you can make tau fu fah with lactone but we can't get lactone here, only gypsum. No idea what lactone is, how much to use or even what types of shops will stock it. You are nearly there ! Try this....increase your gypsum to 3/4 tsp and if it sets, you can gradually reduce in your next trial until you get to a point where you are comfortable with the texture. Because yours is 'scrambled' the bubbles are all over the place. The bubbles should float as you boil the soy milk. Keep skimming to get rid of as much as you can. If you observe a tofu fah stall back home, when they open a new container of tofu fah, you will notice they will skim off the top layer to get rid of the 'rough' first layer. And then thereafter (in between customers) they will skim off the water before they scoop. If you think your soy milk is not smooth enough, sieve it a few more times through a muslin before boiling. Hope to hear good news soon :) . Finger crossed. I just visited your website..ohh..I knew this homemade tau fu fa coz my mother did teached me how to make this when I was kid. But we didn't use cornflour. Anyone of you can't get gypsum powder, you can use Gua Suam instead of gypsum powder. Gua suam available in bakery shop. I've tried making soya bean milk and the tau foo fa using your recipe (using GDL instead of gypsum powder). However, I've encountered this problem whereby the texture of the tau foo fa changes drastically after 2-3 hours. And it turns bad the following morning even though I kept it in the fridge. As for the soya bean milk - it is still fresh the following morning when I keep it in the fridge. Any pointers on where I have done wrong for the tau foo fa? Sorry can't help you as I have no experience or knowledge of GDL. i tried to make the tff today using unsweeted soya bean milk rather than making my own one. Followed the rest of the steps and the end result is still watery.. So I was just wondering maybe the soya bean milk purchased in the shops does not contain enough soy in comparison to the soy milk that you make. SO maybe I need to put less milk and maintain the amount of all other ingredients or put the same amount of milk and bump up the amount of gypsum powder. I would suggest you make the soy milk from scratch. I was making soymilk and tau hu fah yesterday..the result of the soybean custard was too lumpy..and didn't look like a tauhu fah.Maybe my soymilk was too watery or other problem? Did you follow my recipe for making the soy milk? If you have used the exact setting ingredients as per this recipe without any substitution or omission and the custard is still lumpy, try adding an extra 1/4 tsp of gypsum. What is the health danger of using gypsum powder? I would like to know this before making this recipe. You are best to 'google' for that information. My tau fu fah is settling now... Another 25 minutes to go. No peeking! :) Thanks for sharing your recipe! Yvonne do please share the result. Would you mind giving an idea how much 125g of beans would be? ie. half a cup/a third of a cup? I'm a student and dont want to spend 20 pounds on a weighing scale just for this! Thanks! You would most probably be buying whole soy beans. Unfortunately I don't have any whole beans to measure out for you. What I would suggest though is you weigh it at the shop you are buying the soy beans from. That is what I usually do if I want to buy a specific weight without any extra for a recipe. The weight and water content of the soy milk is very crucial to the sucess of the tau fu fa. Too dilute and it might not congeal. Too thick - your tff might not be as soft. I am excited to try this... Do you know if gypsum powder is safe? I am paranoid as I am pregnant. I can't seem to find any definitive info online about it. Thanks! The best person to ask might be your doctor. I am just trying to think whether I have ever seen a pregnant lady eat tau fu fah at a hawker stall back in Msia. Tell your doc the amount of gypsum per bowl is only about one-eighth of a tsp. Thanks for the wonderful recipe. My tofu fah turned out very nice. Nice nickname ! I can see you love your tofu :) So glad your tofu fah turned out well. I was looking for Tau Foo Fah recipe and came across yours. Thank you for the recipe. Gypsum Powder isn't really a safe option to use as compared to GDL. Gypsum Powder is also an ingredient to make plaster boards. GDL is a naturally-occuring food additive used in honey, fruit juices and wine. GDL yields rougly the same amount of metabolic energy as one gram of sugar. I suggest if u can get GDL all the better, tau foo fah sold by hawkers in Malaysia uses Gypsum Powder so better to make your own tau foo fah. thanks for sharing one of ur favs. was just wondering if the recipe can be suitably doubled as i was thinking of making some for a gathering of friends. If you have already tried it and has been sucessful, then by all means double it. Your friends will love this. tori, don't give up. Keep trying. You will get good result in the end. I understand your frustration of not being able to source ingredients. Yes, some of the uses of gypsum are as you described but to be on the safe side, you need to try and get the foodgrade gypsum. How about asking a pharmacy ? My Taufu fah seems to set and the surface looks ok. but its too soft. could it be that i need more gypsum? or more cornstarch or simply let it set longer? I assume you have eaten your taufu fah by now. Was it set ? recently I try using GDL. but it taste a little bit sour. I try reduce the GDL but it make taufufah too soft and yes it reduce the sour but the sour still there. Gypsum is not good for your health especially for your kidney. Its time we change the recipe to GDL. It made from fruit from fermentation. I try this, but my country don't have Gymsum power, Other else. It only have the Lemon Juice, So anyone tell me how to use Lemon juice to make tff? and it need to use Corn flour to make it soft? i tried your recipe 3 times . the texture was superb but the TFF tastes sour . any idea what went wrong here??? 1) Have you tried drinking the soy milk before the TFF stage? Did it taste sour ? 2) Did you use any lemon juice or citric acid to soak your beans or add any to the TFF ? 3) How fresh are the beans ? 4) Did you add any other ingredients besides those specified in my recipe ? hi , why my tau fu fa melt and the tau fu fa tasteless. how i want to serve 10 peple. plese how????!! I got mine from the Asian grocery shop. Hi again, munching on the boiled peanuts as I write - it was still a little crunchy but that's exactly how I like it so that worked wonderfully. I did however triple the amount to fit my pressure cooker (that's my excuse and I'm sticking to it, lol). Soy custard - bought the gypsum from the grocers, it said plaster powder so hmmm... will try it anyway. Meantime after searching exhaustively :P managed to find GDL online, for yr Aussie fans go to The Melbourne Food Ingredient Depot. Btw, Sinner, will your recipe work using bought soy milk coz the last time I attempted to make Japanese tofu my kitchen looked like a tofu bomb exploded in it...my bad, shld have kept hand over blender lid, haha. You are pretty brave to triple the quantity on the first attempt but glad you are happy with the braised nuts. This recipe for soy custard will not work with bought soy milk as you do not know how thick the bought milk is or whether they have put in additives. If you are using GDL then you will have to experiment with the quantity required. To protect your privacy, I won't publish your last comment so you don't get spammed. Thanks for your offer of GDL but I did managed to get some from Spore but it has been sitting in my freezer unused for 2 years. Hi Sinner, np. Am waiting for GDL delivery and time to go get the soy beans/granules. Will let you know how that goes.. meantime, I hosted today's weekly mahjong (made Thai beef salad) and have told the ladies abt your great blogs. cheers! Hi Sinner, got my supplies of organic soybeans, GDL and gypsum and ran a number of batch tests. I'm happy to say the best results was a combination of GDL (glucono delta-lactone) and gypsum with no sour taste and an incredibly smooth soft custard. Using your instructions I cooked up 2 liters of soy milk and poured that into a mixture of 1/2 tsp gypsum, 1 1/2 tbsp cornstarch, 1/4 tsp + 1/8 tsp GDL (sorry, couldn't work it out any other way) in 100ml water. Did that twice with identical results. cheers! When I saw your comment this morning, I jumped into action and soaked some soybeans. Tried out your recipe - halved it as I am the only person eating it. I have already eaten 2 bowls of hot soft smooth soy custard for lunch. Great..as it is such a cold blustery day. You are right - no sour taste. I've tried this three times now, the first time with homemade soy milk that I made from soybeans, the last two times with unsweetened soy milk I bought in Chinatown (only ingredients: water and soybeans). The first time it didn't work at all really and the next morning was liquefied completely into soy soup. The last two worked better (the third time I just put the coagulant in the bottom of a pot and poured the boiling soy milk on top and let it sit there, without any stirring or moving at all, that worked best.) But again, this morning I've lost my nice smooth silky blocks and it's disintegrated into "scrambled" lumpy curds. I wonder what's wrong? Have you successfully managed to make this and keep it overnight? Or must it be eaten immediately? I wonder what is wrong. Do you bring your soymilk to a boil and then continue cooking to a certain temperature? Or just as soon as it boils mix in the coagulant? Also, I don't understand the correlation between backaches and gypsum - why would gypsum cause backaches? Thanks for any help, I'm so frustrated! How much soy bean did you use? How much water to use with the soy bean to get the 1 liter of soy milk? It didn't specify in the ingredient section. Please advice, thanks! for the recipe for the soy milk, please click the 'soy milk' link in either the ingredients or the 'here' link in Method, step 1. Sinner - tried your TFF recipe today and it came out flaky most probably 'cause I used a Soy Milk maker - milk was too thin. Will try again with soy milk made from scratch the ole fashioned way. Failure is not an option esp. since I need to feed my craving for TFF - next batch of beans are already soaking! Thx for the recipe. I've made soy milk and tff a few times usimg your recipe and they turned out great. Thanks for sharing. Just made another batch today. Yummy!! Hi Sinner, tried your recipe several times when we were still in Msia with home made soy bean milk bought froma stall. Worked out fine every time. Now we're in Melbourne and it is winter. This morning I tried making tff again using soy bean milk bought from an Asian store. Didn't set nicely like when we were back home. Looks scrambled. I suspect it must be the temperature or the soy bean milk. I have started a second batch and place the pot in a heated room. Let's see how it turns out. I tried two failed attempt on tau foo fah until I chanced upon your video. It was successful at least I get it to set but I didn't get that silky smooth texture. Can you shed some light as to where I went wrong? Hi Sinner. I just tried your recipe and it was awesome! I substitute the gypsum with GDL and I still got the silky smooth texture and delicious taste, and it's quite firm despite the soft smooth texture. I used the Canadian soybeans as they said Canadian soybeans has the best quality among soybeans. The soy milk was delicious as well. I couldn't thank you enough for this recipe. Going to try for bigger volume tomorrow. Just one question, how long do you think this taufufah will be able to last before it became spoiled? Hi Haziq Zuhair, may i know the ingredients of your coagulant using GDL? Thank You. Hi Dennis. Same measurement as the gypsum. I just substitute it with GDL. no change in quantity.